The Scott Motor Cycle Company's involvement with dirt track racing occurred in a quite unexpected way. 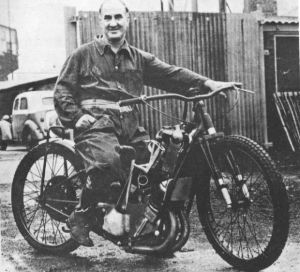 When Frank Varey was detailed to join the Scott riders party to the Isle of Man in the capacity of machine cleaner Allan Jefferies begged him for the loan of his three-speed Super whilst he was away. Unfortunately, the Super was written off completely in a road accident that followed, when Allan was run into by the rider of a Scott sidecar outfit whose sidecar wheel lifted on a left hand bend. The crash did not do Allan much good either, for he suffered a fractured skull, cheekbone and jaw. When he ultimately emerged from hospital it was obvious that a machine would have to be built from scratch, since even the Super's crankcase had been cut in two by the force of the impact. Putting their heads together, Frank and Allan decided they might as well build a machine that could be ridden on the cinders. And so, from a quite calamitous beginning, a dirt track Scott began to take shape. To assist with the finances, Allan promoted two meetings at the nearby Greenfield Dog Track and at various tracks in Lancashire. According to Allan, it was Frank's superhuman strength and courage, coupled with their complete ignorance of steering geometry that made Frank such a spectacular favourite with the crowds. His lurid style of riding and the scream of the Scott on full power drew spectators in large numbers and soon word got around to Harry Langman, who took such an interest in the project that it was decided to add a dirt track model to the official Scott range. Cecil Knowles of the Frame Shop organised production, using a frame that was a cross between that of the Flyer and the Super, a formula worked out by Frank and Allan the hard way. The dirt track model neared completion one Saturday lunch-time, on the day when Frank was due to ride his own model at Bolton the same afternoon. Anxious to give the new model an early try-out, Allan agreed to remain at work so that the new model could be completed in time for delivery to Rochdale Town Hall Square by tea-time, to enable Frank to try it at an evening meeting in Salford. In return, Allan would take over the old machine, so that he could have a ride at Rochdale. Like all deadlines, the completion of the machine was met with some difficulty, but Allan eventually set off for Rochdale, just in the nick of time. Both riders agreed to meet up towards midnight at a much-favoured steak pudding shop in Littleborough, where there was a parrot they were teaching all kinds of quite unmentionable phrases. When they finally got together, Frank was clutching a Golden Helmet, the major award presented to the star of the meeting at Salford. The parrot learnt much that night during the session that followed. Frank Varey became a star rider almost overnight and promoters all over the country clamoured for his entry in their meetings since this would guarantee a packed stadium. Allan acted in the capacity of tuner, mechanic, chauffeur, valet, masseur and on one occasion, dentist. Soon the two partners were traveling over 1,400 miles a week to various meetings and there were few tracks where Allan did not whip off the crankcase doors to clear out the excess oil before the next race. Although many other riders bought Scott dirt track models in the hope that they could emulate Frank's passage to the top, none ever had anything like the same measure of success. 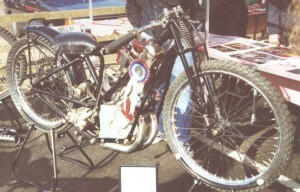 Frank Varey, the "Red Devil" astride the original 1929 dirt track model that brought him fame. The manufacturers of the Scott employed an open frame and a TT engine, and it was said that the Heart-rendering yowl of this particular machine was terrifically exciting. The model had a 3-speed gearbox, specially braced Scott forks of the old type, (later fitted with "Super Squirrel type forks) a smaller than standard radiator and a very neat exhaust system. The machine was available at 95 pounds and had been selected, among others by Arthur Franklyn, Frank Varey, Wilf McClure and Oliver Langton. 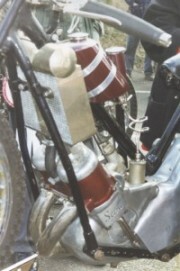 There was no kick start on these Scotts and the entire Primary and magneto transmission was enclosed, the absence of exposed mechanism was a notable feature. Pictured, one of the greatest of all Speedway riders. 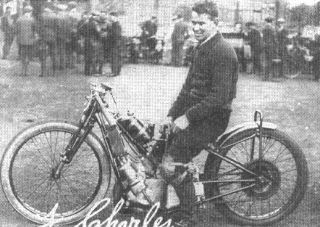 The late Frank Charles on his 1929 Scott.